We all know that first impressions count – whether you are meeting an important client or that important negotiation with a supplier – the judgement starts from the minute they walk through the door. That’s why reception areas are key in making an exceptional first impression! This can be done in so many ways – offering nice refreshments, being greeted by a friendly face, and making sure your office décor is inviting and comfortable. Orangebox has a fantastic range of attractive and effective reception furniture like the items in the Vale range. Vale is a collection of contemporary items including single sofa seating, sofa and stools. 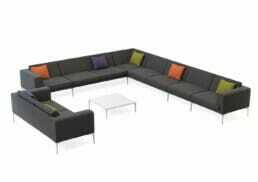 They come in a wide variety of colours and finishes and can be adapted to make the best use of your office space.